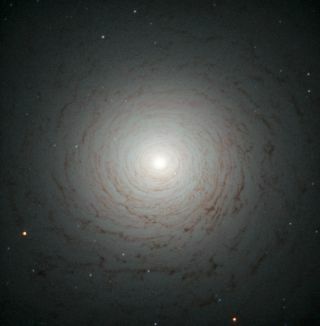 The galaxy NGC 524 is a lenticular galaxy with an intricate spiral shape, which was imaged in a photo released July 22, 2013 by the Hubble Space Telescope. A mysterious spiral of doom — okay, just a spiral-shaped galaxy — has been captured in a new image by the Hubble Space Telescope. The object belongs to an uncommon class of galaxy called lenticular galaxies, thought to represent the transitional phase between middle-aged spiral galaxies and old elliptical galaxies. When spiral galaxies are hale and hearty, they are full of gas being transformed into new stars. Eventually, all this gas gets used up or lost to space, and the spiral loses its structure, ultimately ending up as a spherical elliptical galaxy. Lenticular galaxies are stuck in between these two major phases of galaxy life. This one, called NGC 524, has managed to retain most of its intricate spiral structure, and appears face-on to Earth as an almost perfect whirlpool. By observing the galaxy, researchers determined that it still maintains some of its spiral motion, allowing it to keep its structure. NGC 524 lies about 90 million light-years from Earth in the constellation Pisces. The new Hubble photo was released July 22.